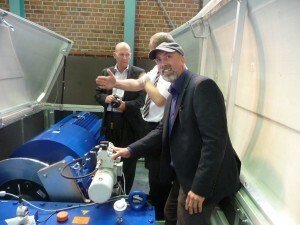 The turbine we have selected is a WTN 250. This is a very sturdy 250 kW machine, with over 150 operating worldwide. The turbine is made in Northern Germany. For more details please see the brochure from our suppliers, RM Energy. They also have a page giving some of the reasons we chose the turbine. 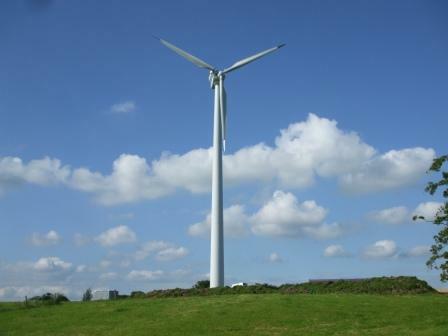 Planning permission was initially obtained for another turbine in October 2012. An amendment was sought and obtained in February 2013 to use the WTN turbine. Overall I was very impressed with WTN personnel, organisation and turbine design and construction. I am convinced it will be as reliable as they say it will. The picture shows Miles inside the nacelle of the turbine next to the generator.